In Riffing on Star Wars #6, we discussed the most well-known ship in the Star Wars galaxy, the Millennium Falcon. Today, we will talk about one of the most identifiable, the X-wing, the star fighter debuted in the final act of our favorite film from 1977. Revealed in the rebels’ hangar bay inside a vine covered temple, the sleek craft echoed the real life fighter jets emerging in the aerial armada of the NATO powers and drew upon George Lucas’ World War Two cinematic inspired dogfights. It was the fighter of the good guys, one in which our hero, Luke Skywalker, went from anonymous farm boy to bona fide galactic savior. The X-wing virtually everyone grew up knowing and adoring is the Incom T-65 and the flight of X-wings departing Yavin Base for the Death Star remains one of silent moments to appreciate in the film (one of the things which George Lucas improved upon in the Special Edition, by adding a bit more dynamism). Toss in Red Leader’s command, “Lock S-foils in attack position!” and the surprise visual of fighter’s wings splitting in two to form that iconic ‘X’ shape and you have a star fighter already targeting your heart. While not immediately clear in the following Battle of Yavin, we quickly came to appreciate the ethos of both the Rebel Alliance and the Galactic Empire in their namesake fighters. TIE fighters, which by the end of the original trilogy had assumed four variations, Fighter, Advanced, Interceptor, and Bomber, all basically suffered from the same weakness, vulnerability (the Advanced model being Vader’s, it’s the exception that makes the rule). As the films and Expanded Universe made clear, TIE fighters were considered expendable, and by extension, their pilots. The Empire, which dominated the galaxy in part by its ability to mass produce its nightmarish war machine, elected to produce a system which creates enough pilots to keep up with the inevitable attrition rate than to add the cost of protecting the TIE pilots. Conversely, the rebels, having nothing close in resources opted for the X-wing, a tougher, better shielded ship. More so, the sturdiness of the fighters indicates the value the rebels place upon their pilots. By the conclusion of the original trilogy, the X-wings and their pilots were solidly the most beloved rebel fighter. This appears in Return of the Jedi, at a point at which the Rebel Alliance counted four different fighters under its umbrella: the X-wing, the A-wing, the Y-wing (more a bomber/fighter) and the B-wing. Yet, it’s the X-wing which is given the coup de grace torpedo shot inside the Death Star and flown by the only known returning pilot from the first film. Why was the X-wing singled out for this duty? Was it simply a chance to echo the destruction of the first battle station? Or was it just the fact that the X-wings remained extremely popular? The popularity of the fighters continued into the Expanded Universe, notably in the form of Rogue Squadron. Lead by Wedge Antilles, the squadron of X-wings were singled out as the best pilots the Rebel Alliance. Their missions took form in both novels and comic book series of the same name. Nor was it unusual for Luke Skywalker to find his way back to an X-wing for his own post-Jedi forays into the old Expanded Universe. Even after that expanded universe disappeared, Skywalker’s continued presence in the cockpit of a X-wing continued in the new one, strengthening the craft’s identification with one of the great heroes of the Star Wars franchise. The X-wing even found itself at the forefront of computer gaming. One of the early successes of LucasArts’ Star Wars based games was the flight simulator, X-wing. 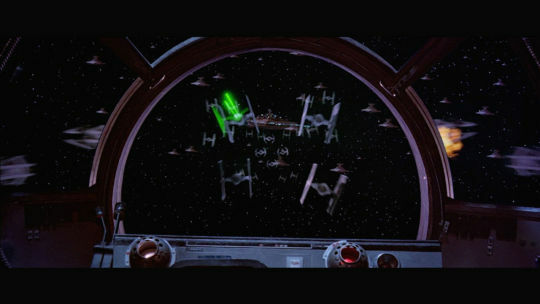 It provided players the chance to get behind the flight stick of the fighter and complete missions of increasing difficulty, culminating in the Trench Run against the Death Star. 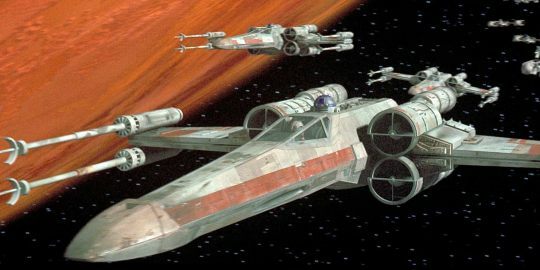 X-wing was so popular, it spawned TIE Fighter, and X-wing vs TIE Fighter, which included the nascent ability to fly against others at the speed of modem. The love of the X-wing even extended to the creation of its predecessor, the Incom Z-95 Headhunter. This older craft brought something akin to the X-wing (essentially an X-wing without the S-foils to make an X) to the prequel trilogy era and the Clone Wars. And so, the X-wing in one form or another was established in the past. Jumping ahead to the future, the time period of The Force Awakens, the X-wing also found a new home in a new form, the Incom T-70. 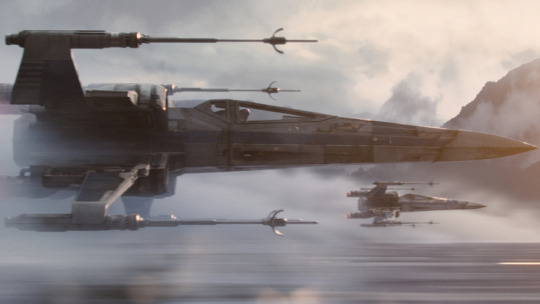 The first fighter craft of The Force Awakens era seen in the film is the X-wing. Flown by Poe Dameron, a character who originally was supposed to have died long before returning to the stick of the iconic fighter, the true impact of the X-wing on Star Wars fandom becomes incredibly evident in the battle near and among the ruins of Maz Kanata’s castle. Setup with a stunning shot of X-wings soaring just feet above the surrounding lake, Poe Dameron’s fighter flies through the air, executing incredible turns and pinpointing First Order Stormtroopers on the ground with deadly precision. Squinting at the scene, it’s not hard to imagine a X-wing loving ten year old guiding her own X-wing in hand through the very same scenario. Faster, sleeker, and even more powerful than before, the X-wing in the form of the T-70 is the fan’s X-wing. The end of The Force Awakens offered one more battle of X-wings duking it out with swarms of TIE Fighters, and a single X-wing destroying a planet killing laser platform. In the wake of the movie, Dameron’s character has become immensely popular, spawning a comic book series about his heroics before the film, which unsurprisingly, involves gathering the best pilots in the Resistance into an X-wing squadron. The cherished place of the X-wing in the hearts and minds of Star Wars fans will undoubtedly continue to persist, if not grow even greater as the X-wing remains at the forefront of the war amongst the stars between the Resistance and the First Order.